In boxing, a lot can happen in a year, and this has definitely been the case for this fight and for these two fighters. Since that night in Las Vegas 2017, where these two elite boxers met for the first time, all eyes were on the rematch, which just had to happen. The controversial ending which had ringside judge, Adelaide Byrd scoring 118 – 110 to Canelo Alvarez, in a fight which should have had Gennady Golovkin, a clear winner , had enraged fight fans around the world, particularly on social media. I had GGG winning 7 rounds to 5, and that was being kind to the Mexican. A draw was a bad ending , to a great event, and an entertaining fight for the millions of fans watching around the world . They deserved better, and so did Gennady Golovkin. The biggest issue for me, was the fact that Golovkin’s perfect record had been altered for the remainder of his career, and beyond. Adelaide Byrd was told to have a spell from boxing for a while, and we all moved on, focusing on the rematch. The rematch was announced for the Mexican holiday week end, Cinco De Mayo which was the 5th of May 2018 , and both fighters went into training camp, to both do what they do to be the best they can possibly be to win . Golovkin [ 38 wins, [ 34 kos ] 1 draw. ] went up to Big Bear, and Canelo [ 49 wins, [ 34 kos ] 1 loss, and 2 draws. ] trained in his gym in Mexico. 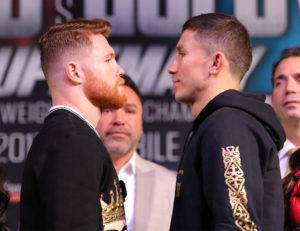 There was great excitement, and the build up to the fight was all about Canelo getting some “home cooking” in Vegas, and the countdown was on for both teams and the boxing fans. As soon as I saw this, I knew the fight was off. Later, Canelo stated and claimed that he was a clean athlete, and that the drug was widely used in the meat industry in Mexico, and he had eaten some beef that had been affected. Shortly after there was a decision by his team and his promoter, Golden Boy to withdraw from the contest. Canelo was banned for 6 months, as opposed to a 1 year ban for testing positive to a banned performance enhancing drug . With only a few weeks to go till May 5th, it was unclear if there would be a fight at all. The T-Mobile Arena was sold out for the mega fight with Canelo and tickets were refunded. The event was then rumoured to be heading across to the MGM garden arena, all the while trying to find a viable stand in to replace a Mexican superstar fighting on Cinco De Mayo . Not an easy thing to do. Although I had planned and paid to travel across from the other side of the world for GGG v Canelo, I was glad the fight was off. If they didn’t ban Canelo, it would have devastated the sport of boxing. At the time, I didn’t think Golovkin would be fighting anyone. Not long after , it was announced that GGG would be fighting and the venue would be in Carson Los Angeles, at the Stub hub arena. The opponent would be Vanes Martiroyan [ 35 [ 21 kos ] 3 loss, and 1 draw ] A rough tough boxer who had been fighting for years, and had experience in world championship fights against Demetrius Andrade and Erislandy Lara, as well as Jermel Charlo. Lets face it, at that late stage we were lucky just to get a fight. Was the Armenian ever going to win? No, but we got a fight. Golovkin unleashed and showcased his formidable talents of pure speed , controlled aggression and power, ramming home the jab, then taking him out with a fistful of punches , to end the night with a fist full of dollars and a quiet realisation that this was over. With that difficult period over, it didn’t take long before the rematch with Canelo being all the talk. [ Also in that time, Golovkin was stripped by the IBF, for not making his mandatory defence . A lot of talk, until finally we got the fight we all want to see. The biggest fight in the sport of boxing. Canelo v Golovkin 2. The big question in this fight is, can Canelo do anything different to beat Golovkin? If he doesn’t, he will get beaten again and possibly get knocked out this time around. To win this fight, he has to fight for 3 minutes of each round and stay off the ropes, which he has a habit of doing . Golovkin and his trainer, Abel Sanchez will have been watching the tapes and they will see he can’t fight going backwards. In the first fight, he retreated to the ropes and waited for GGG to throw punches, closed up a tight defence, then push off the back foot, to try and surprize GGG hoping to get the attention of the ringside judges. The man from Kazakhstan will have learned from the first fight that he was waiting too much, not throwing punches, whilst Canelo was on the ropes. This time round, he has to hammer him. Canelo has a great jab and he has to throw and establish that jab, followed up by his superb uppercut and finish with a hook. He has to push forward and put pressure on Golovkin. If he can do that, he will unsettle him and stop Golovkin’s momentum. I think GGG is open to the uppercut all night long as he carries his head down, chin up , with little head movement. If the Mexican comes to fight and try to knock out Golovkin, we will see a much different fight . Canelo Alvarez can win this fight. Will he have an easy time if he comes forward, No, but this time he has to . Golovkin knows he won the first fight, and he now has in his mind that Canelo had a bit of help from a banned substance and with that, he would definitely think he has the edge , mentally. Is there anything he will do to change the way he fights, and I would say no other than sustained pressure off his ram rod jab. He will chase Canelo and cut the ring off, and throw a hard thudding jab setting up the huge straight right hand [ and or , an overhand, right or hook ] . He will take one coming in to land one of his own because he knows his is usually better . A big fight for all the marbles [ other than Billy Joe’s WBO belt , and the IBF strap.] so there will be pressure for both fighters, but most of the pressure will all be on the 27 year old Canelo Alvarez. There is talk of there being bad blood between the two fighters. Historically this has been used as a tool to promote a fight but with what has happened in the last year, I would say it’s much more than bad blood. This is a legacy fight that was tarnished. A controversial beginning, to a scandalised middle, to settling a score, and having a defining ending. Gary Todd is an international best selling author with his books on world champions and their workouts. “Workouts From Boxing’s Greatest Champs “ Volumes 1 and 2. He has been involved in all aspects in the sport of boxing for over 30 years.